Schwarz Studio Inc. of St. Louis, Missouri is celebrating itsanniversary. Founded in 1882, it is the oldest taxidermy business in the United States of America. The company, located at 8520 Gravois Road, continues to enjoy a nationally-recognized reputation for its consistent high-quality craftsmanship. Schwarz Studio is owned by Frank Wagner Jr., who bought the family-owned businessyears ago after working there since 1978. He and employee Jim Whinnery turn out a wide variety of mounts, which include white-tail deer, Western big game, African big game, turkey and other game birds, waterfowl, fish and reproduction fish mounts. Every year, numerous sportsmen trust the Schwarz artisans to bring their prize trophies to life-like appearances. They have also furnished zoos, museums and schools with mounts. The studio was founded by Frank Schwarz, a German immigrant who came to St. Louis with an impressive amount of formal schooling. In his hometown of Hanover, he had spent three years at the Academy of Fine Arts, studying sculpture. He had also studied anatomy at Heidelberg University, and served as a taxidermy apprentice at the Berlin Museum. After settling in St. Louis, Schwarz worked for Singer Sewing Machine Company, and during his free time, built up a clientele for his taxidermy services. Schwarz Studio opened for full-time business in March 1882 - the same year that the now-St. Louis Cardinals played their first Major League baseball game. As the taxidermy business grew, so did its need for more space; in 1907, the studio moved into a brick building in Lafayette Square and soon became nationally known. At the time, African big game hunting had become extremely popular, spurred on by publicity of former U.S. President Theodore Roosevelt's safaris. Not surprisingly, much of Schwarz Studio's early work involved turning out big game trophy mounts, and the company's early clients included such notable names as William Jennings Bryan, Kaiser Wilhelm II, and August A. Busch, Sr. In fact, Schwarz Studio continues to do the work for fourth-generation sportsmen in the Busch Brewery family. 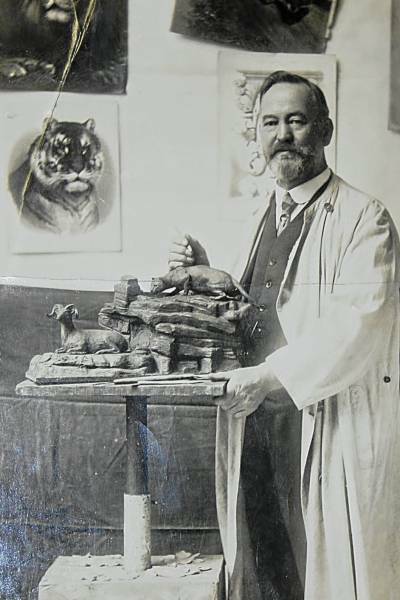 Throughout the studio's early history, Frank Schwarz's reputation as a premiere taxidermist and knowledgeable naturalist continued to grow. In 1911, it was Schwarz who brought together nearly a dozen local naturalists at his studio to plan the formation of a St. Louis Zoological Society, known today as the St. Louis Zoo. As the years passed, Frank began teaching taxidermy to his sons, Max and Paul, who helped in the studio. They also eventually took sculpture classes and learned to sculpt realistic-looking forms that they needed for taxidermy. The finished result, a mount that looked amazingly life-like, further increased the studio's sterling reputation. Always on the lookout for creative ways to display taxidermy, Frank early on introduced the use of wood-framed glass bubbles to protect mounts of smaller birds and fish. Featuring hand-painted background scenes, the glass bubbles are an attractive way to display the mounts in virtually airtight protection. In 1933, Frank Schwarz died and his sons inherited the business, joined by Paul's son, Paul Jr. The third generation Schwarz began his work in the studio, as had his father and uncle, as an apprentice. When he grew up, however, Paul Jr. followed interests outside the studio, preferring instead to teach and work as a chemist in a foundry. The family's artistic bent proved to be a strong pull, though, and in the 1950s, he chose to rejoin the business founded by his grandfather. As Max and Paul Sr. reached their golden years, Paul Jr. began teaching taxidermy to his son, Carl, the fourth generation of Schwarz to work at the studio. By 1974, both of the elderly brothers had died, leaving the family-run business in the capable hands of Paul Jr. and Carl. They were soon joined by two taxidermists; bird specialist Jim Whinnery and Frank Wagner Jr., a mammal specialist. At the time, the studio was receiving an increased number of native species, the result of a highly successful national emphasis on conservation measures. The wise management of wildlife led to an increase in hunting, with the studio receiving larger numbers of white tail and mule deer, pronghorn antelope, elk, turkey, pheasants and waterfowl. In 2002, Frank Wagner Jr. purchased Schwarz Studio and moved it to its present Affton location. While much of its business continues to revolve around native species, the studio's work remains as diverse as ever, with the taxidermists also turning out many exotic mounts for satisfied customers from across the nation. Elegant company board rooms, personal dens, and museums alike showcase the studio's work, ranging from life-size lions, to should mounts of giraffes - to a full size gorilla completed for the St. Louis Science Center. Emphasis is placed not only on the creation of a life-like full mount, but on its display, as well. The Schwarz taxidermists possess impressive knowledge about specific plant species - and even what types of rock - are authentic to a particular animal's habitat. Once the appropriate setting and fauna are selected, the finished mount is then displayed in a remarkably life-like setting. In recent year, there has been an increase in orders for the studio's fresh water fish reproductions. Created entirely of manmade materials, the fish is made to replicate what a sportsman has caught - and then released. With the increased popularity of 'catch-and release' fishing, the fish reproductions provide proud sportsmen with a way to display their trophy catches, while also ensuring the ongoing reproductive cycle of the fish species. Schwarz Studio offers this service by recording the length of a trophy fish, its weight and then, using a photo of the catch, provides the fisherman - or fisherwoman - with a permanent display that, according to Wagner, looks as good as the real fish and lasts forever. Whether providing sportsmen with reproduction fish mounts, trophy deer heads or full-body mounts, Schwarz Studio continues to maintain its well-earned national reputation for excellence first begun by its founder,years ago.